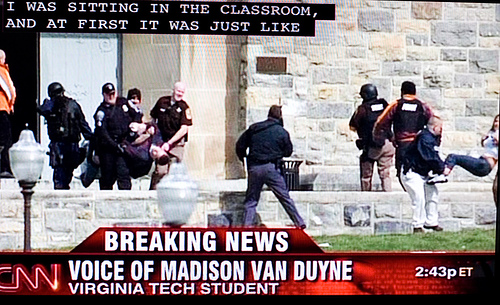 Four years ago, in April 2007, Virginia Tech experienced the deadliest school killings in American history. Gunman Cho Seung-Hui shot more than 40 people, killing 32. The rampage began when he shot two students in a dormitory. Two hours and 15 minutes later, the University sent out an email advising that there had been a shooting on campus. A few minutes after that, Cho resurfaced and began a bloody massacre that resulted in most of the student deaths. Now, four years later, the federal Department of Education has advised Virginia Tech that it will be fined for violation of the Clery Act, a federal law that requires timely reporting of crimes on campus. The amount of the fine is a paltry $55,000 — the maximum permitted under the law — although the Department of Education letter to the school helpfully says that “Virginia Tech’s violations warrant a fine far in excess of what is currently permissible under the statute.” Virginia Tech could have been stripped of some of the $98 million in federal student aid it receives, but the Department of Education decided not to take that step. Virginia Tech has said it will appeal the decision. Does anyone else find this situation farcical? A horrific tragedy occurs, 32 people are killed, and four years later the federal government levies a $55,000 fine? The whole situation is so ludicrous it seems like an insulting joke. If it takes the feds four years to fine Virginia Tech such a paltry sum for such a colossal loss of life, what is the point of having a federal role at all? And really, what is the federal interest in crimes committed on a college campus? That some of the students who were shot down will be unable to repay their federally guaranteed student loans? This is another example of the absurdity of the federal government’s continuing intrusion into all facets of American life. The response to most criminal acts, like Cho’s rampage, should be a matter for state law and state courts. There is no need for a federal role — and certainly not when the federal government moves with such leaden speed, and assesses such a ridiculous fine for such carnage. Does anyone doubt that the amount spent on the federal investigation into the Virginia Tech shootings far outstrips the negligible $55,000 fine?